lighting for every room—and its function—in the home. The kitchen is one of the most functional areas of your house, requiring clear, well-lit counters in order to cook, wash dishes and make the obligatory pot of coffee each morning. This requires general ambient lighting from a flushmount or pendant as well as more task-oriented lighting provided by a modern undercabinet lighting system. This system ensures that all areas of the kitchen are lit, preventing shadows from being cast where knives, mixers and other potentially dangerous tools are often used. Today’s dining room should be primarily concerned with two things: food and fashion. It’s not enough to eat a juicy prime rib under a simple, uninspired linear suspension. No. 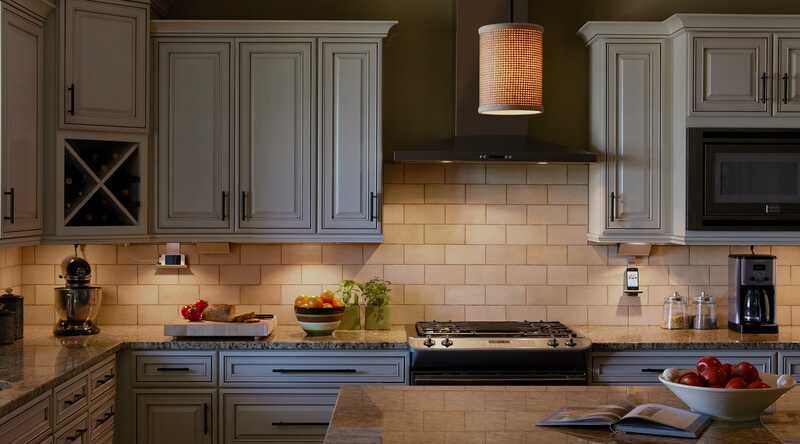 Now is the time, and here is the place to complement your well-prepared meal with a well-designed fixture that provides warm ambient lighting with a distinct decorative flair. Such lighting can include linear suspensions, expansive flushmounts and medium- to large-sized pendants. Decorative wall sconces that offer similar soft lighting are also encouraged for creating just the right atmosphere. Unlike most rooms in your house, the living room is an all-purpose area where you can read, watch television and hold dramatic conversations with your in-laws. And so, lighting in this space requires a much more diverse approach. In general, a large pendant or chandelier is ideal for spreading a sufficient amount of ambient light. For specific areas, table lamps, floor lamps and sconces provide more direct light, allowing you to perform specific tasks or give your space visual depth and shading. Though it’s tempting to type out that report on the couch during the commercials of an important playoff game or season finale of your favorite television show, the home office is far and away the best place to get work done. This space requires more function-oriented lighting in order to create a productive environment, often involving floor lamps and adjustable table lamps—the more convenient the better. The bathroom is perhaps the most unique room in your house, serving as a chamber for bathing, preening and other self-observant activities. Beyond sanitary purposes, a useful amount of adjustable ambient light from flushmounts, wall sconces and bath bars will help you prepare the best version of yourself to show to the world. Though today’s bedroom is a much more lively place, often involving television, video games and dancing terribly to your favorite song, one important factor remains: Your bedroom is a place in which you’d eventually like to fall asleep. This sometimes neglected but oh-so-important quality calls for soft ambient lighting, as from a chandelier or decorative flushmount that can be conveniently dimmed and/or turned off remotely. Accent lighting for the walls is a great way to give your space a decorative feel. Wall-mounted reading lamps are a necessity to provide adjustable task lighting to help illuminate a nightstand or that book you just can’t put down. So, the next time you move into a new home or decide to update your current one, don’t forget to consider the purpose of each room when choosing your lighting. This simple, but often overlooked step will help you maximize the look and function of any given space, while helping you avoid some awkward conversations with friends and family about why there’s a floor lamp in the kitchen, a mini-pendant in the home office or a reading lamp in the bathroom.